NEW YORK, Nov. 3, 2017 /PRNewswire/ -- David Yurman, America's premier jewelry designer, is pleased to announce the opening of a new and expanded boutique in Austin's luxury shopping destination, The Domain. 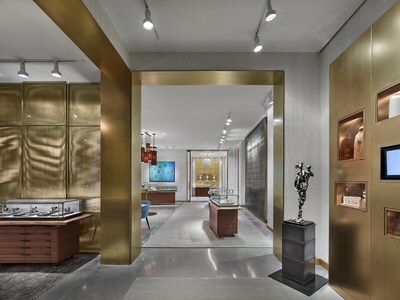 Designed by David and Sybil Yurman, the boutique reflects the brand's aesthetic and the family's unique artistic expression. The entrance lobby features a heritage wall that visually narrates the Yurmans' journey from art to jewelry with examples of David's early sculptures and wearable art pieces alongside more current designs. 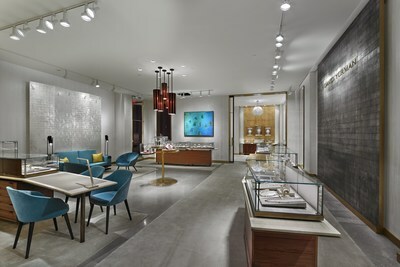 The new boutique will nearly double in size to 2,327 square feet, the interior of which is inspired by the colors of the brand's most iconic gemstones and the hues in Sybil Yurman's paintings hung throughout the space. These subtle shades were introduced sparingly in the boutique through the use of rich fabric upholstery covering various vintage and custom-made furnishings. The expansive main sales area includes a white gold leaf decorative panel featuring a hand applied pattern of the Texas State Flower, the Bluebonnet, a seating area with jewel-toned fabrics, our cluster display fixture and an array of custom decorative pendant light fixtures. Other distinct features include a men's jewelry area and a private salon serving as a destination to discover David Yurman Wedding and High Jewelry collections. The men's area has a distinctly masculine feel created through the use of darker materials and found objects. Vintage furniture and decorative elements alongside simple, natural materials are a nod to Chief Creative Officer Evan Yurman's creative workspace and men's showroom, Noumenon, in New York. 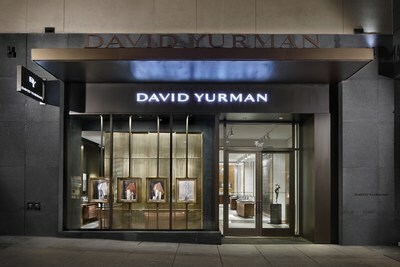 David Yurman, The Domain, 11600 Century Oaks Terrace, Austin, TX, 78758.